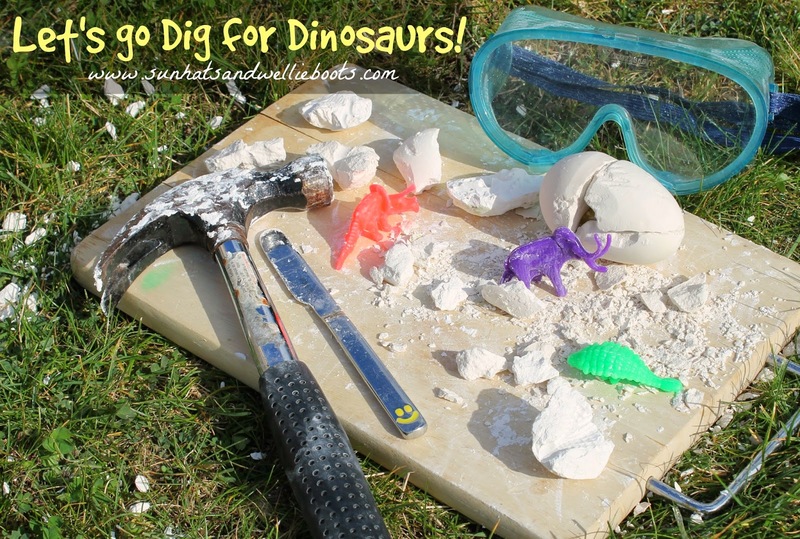 Ever wanted to dig for dinosaurs? 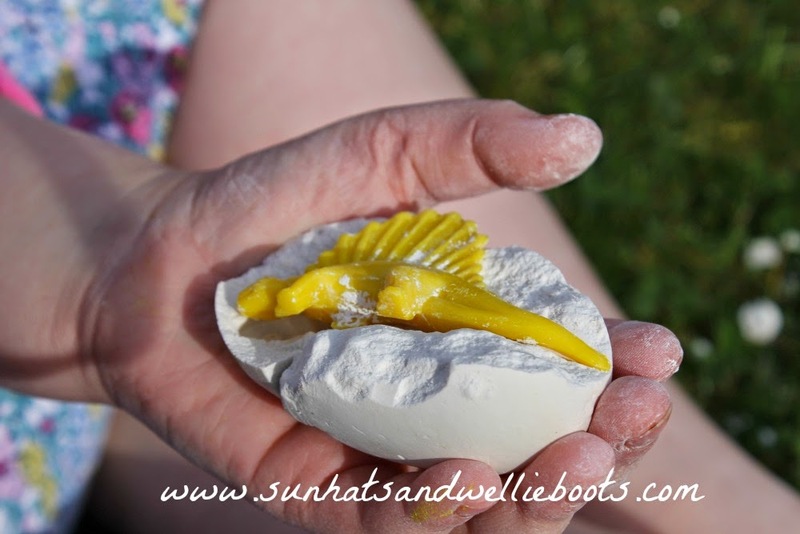 This activity invites children to not only dig for dinosaurs but to become mini paleontologists & discover fossils too. 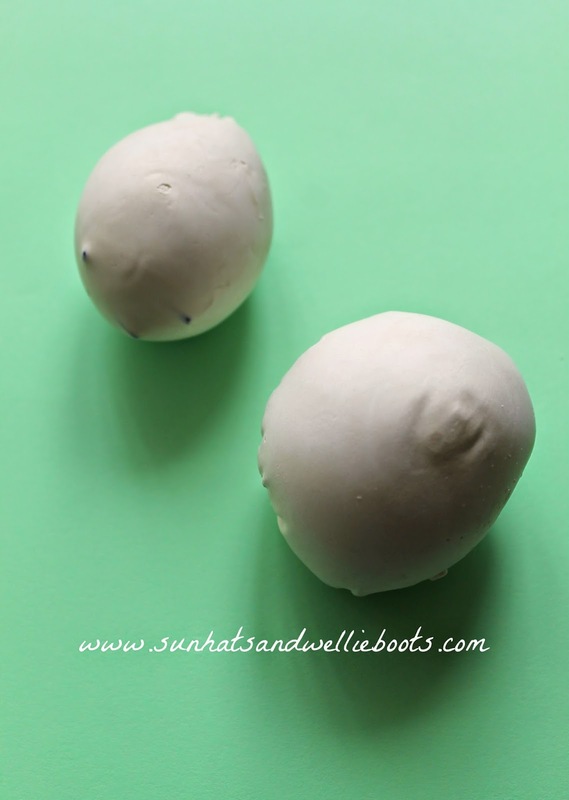 With a couple of ingredients we created these dinosaur eggs that were super simple & quick to make. 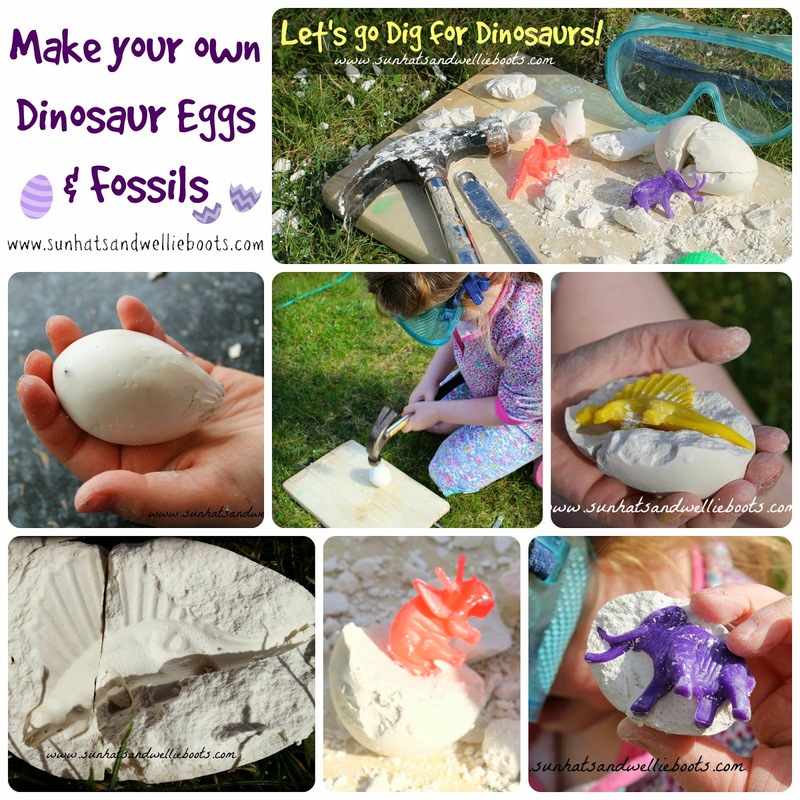 To create our dinosaur eggs we used small plastic dinosaurs, balloons (larger balloons work best), an old container & spoon, water & Plaster of Paris. 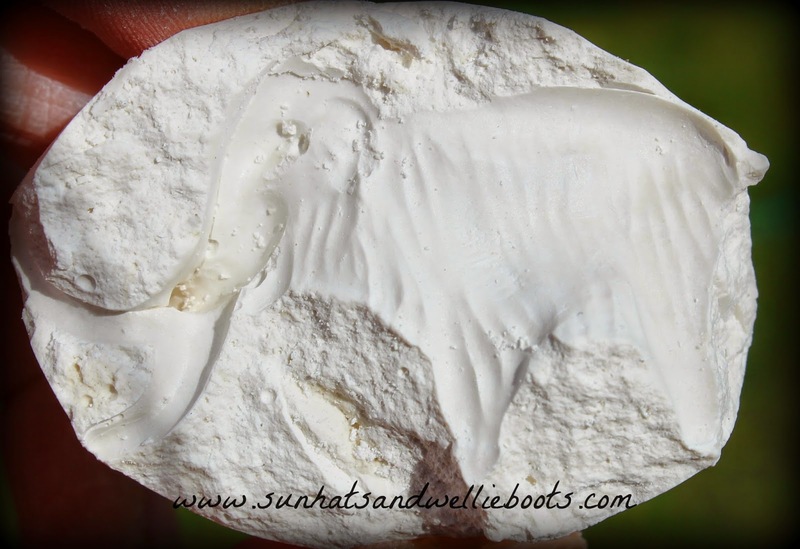 I started by carefully adding the Plaster of Paris to water in an old container before mixing with an old spoon. (I combined the powder & water away from Minnie to prevent her from breathing it in.) The recommended ratio for Plaster of Paris is 2 parts powder to 1 part water. 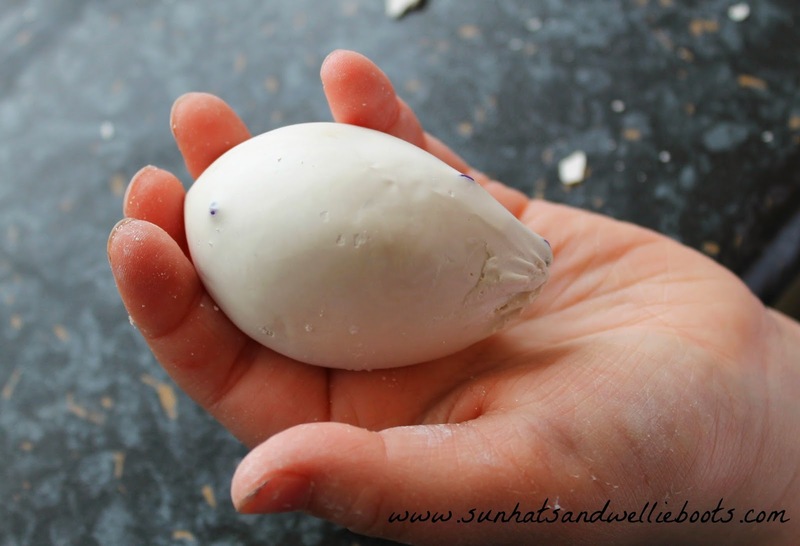 For our eggs we used 2 cups of powder & 1 cup of water which gave us plenty of plaster to create 4 dinosaur eggs. Now for the slightly messy part. 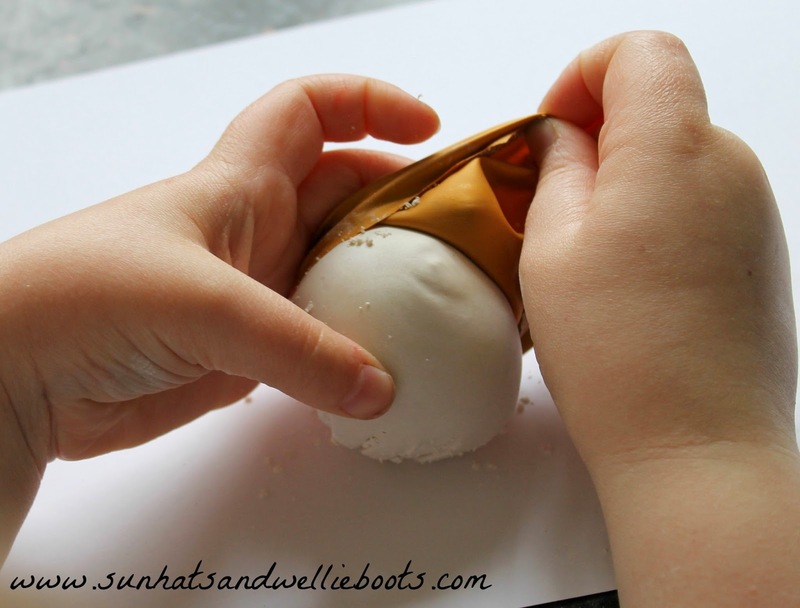 To create the mold for your egg you need to cut off the 'neck' of the balloon, & then open it with your fingers by pushing them apart inside the top of the balloon, then fill with the plaster. 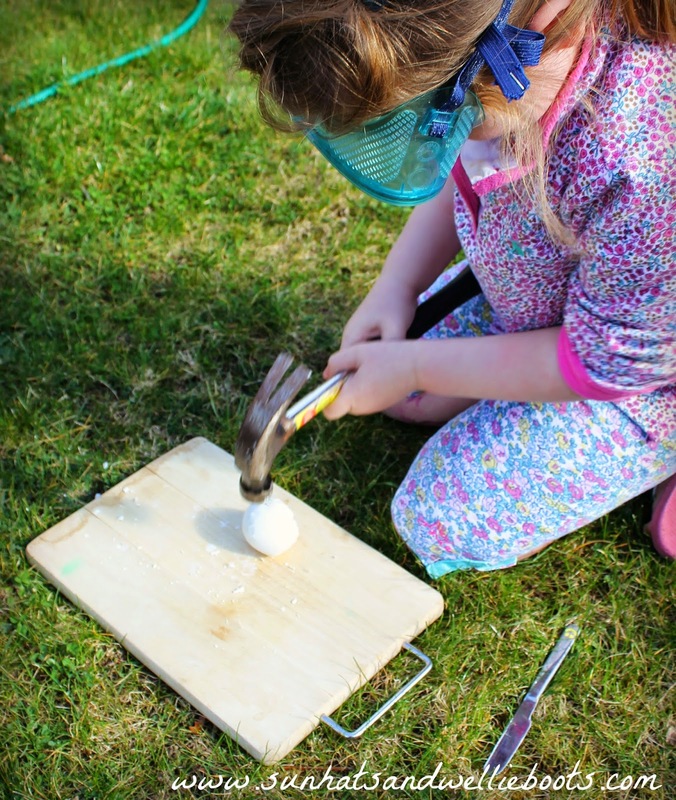 It helps if you have little hands to add the mixture to the balloon, when we made ours Minnie added the plaster with a teaspoon while I held the balloon open. We filled the balloon almost to the top & then added one of the dinosaurs to the plaster, making sure it was covered by the mixture. I then removed my fingers from the balloon & we tied the opening securely with a length of string & hung the balloon to dry for 30-45 minutes. 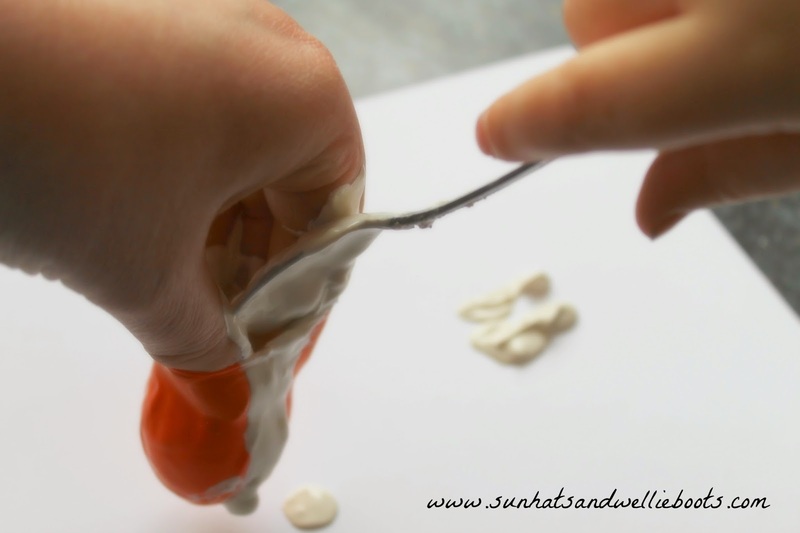 Be sure to wash the plaster from your hands immediately after filling the balloons. 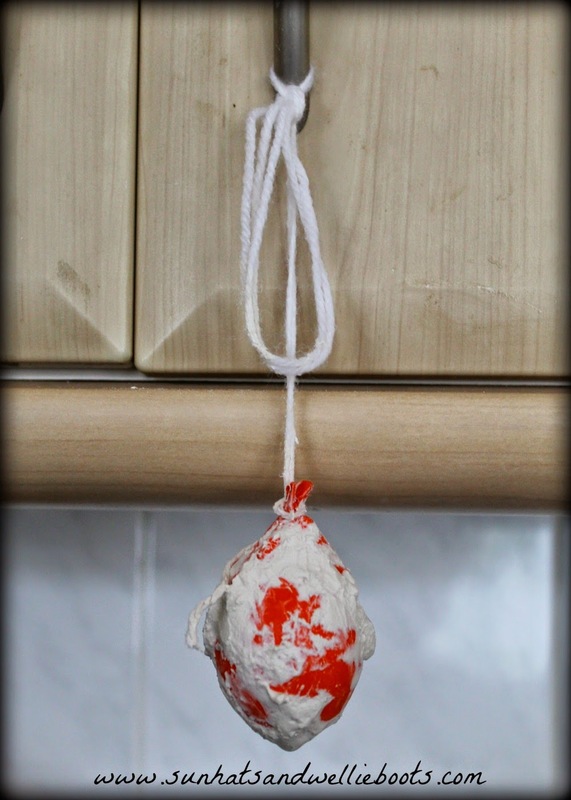 As you can see from the picture below some of the plaster was squeezed out of the balloon when we tied it up. This makes little difference to the end product as the plaster will still form an egg-like shape when the balloon is removed. 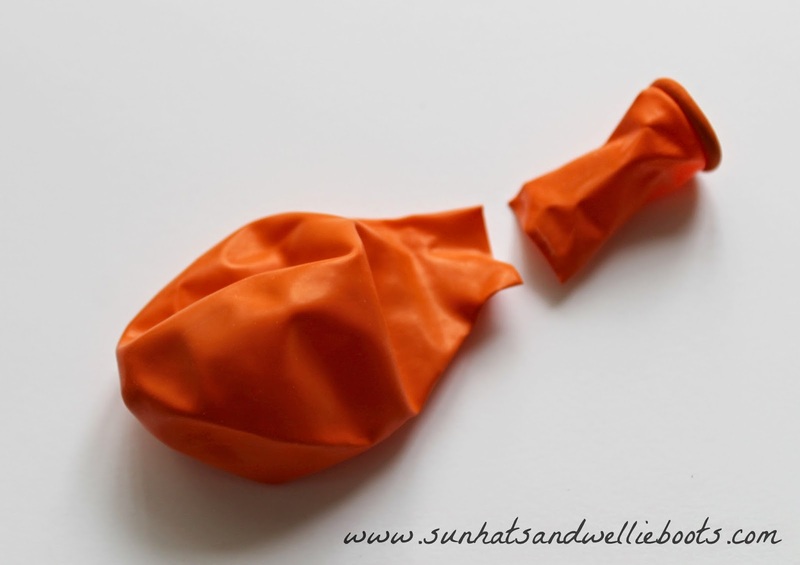 After 30 minutes check the balloon feels solid & if it does you're ready to cut away the string & the top of the balloon. To release the egg simply peel off the balloon. 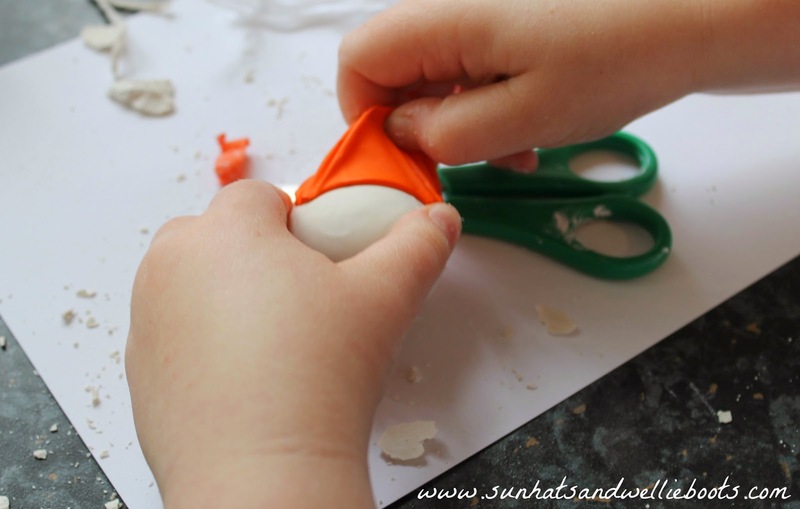 We tried to make these plaster eggs using plastic Easter eggs but when it came to removing the plastic eggs it was just to tricky for little hands to do independently. The plastic Easter eggs also took longer to set than our balloon egg molds. Just removing the balloon & finding the solid egg created much excitement in our house as we discovered the liquid had transformed into a solid! Our egg also felt warm (due to the chemical reaction of the water & plaster) which was a neat discovery too. Before starting to dig for our dinosaurs we collected a few tools to help us including an old wooden board, child's blunt knife, hammer & safety goggles. Please note this activity was done under close adult supervision. I think it's always important to consider children's ages & abilities before undertaking any activity. 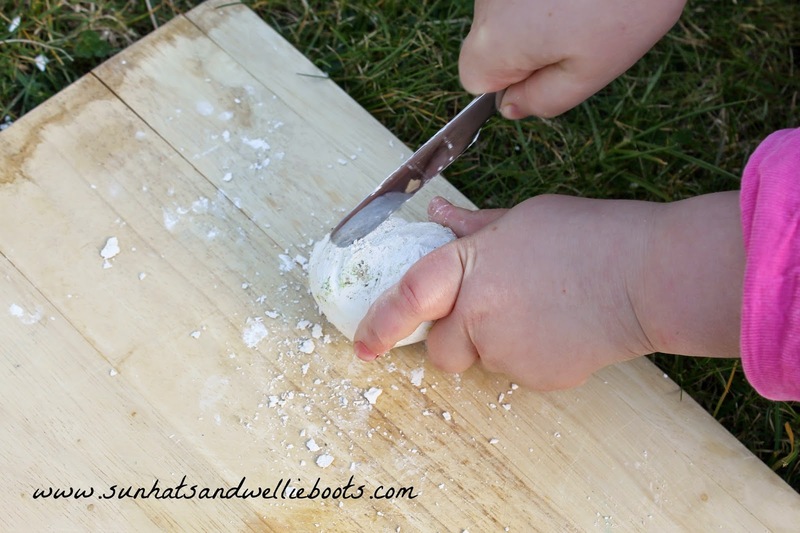 My mini paleontologist started her excavation by tapping, & then banging the egg with a hammer. 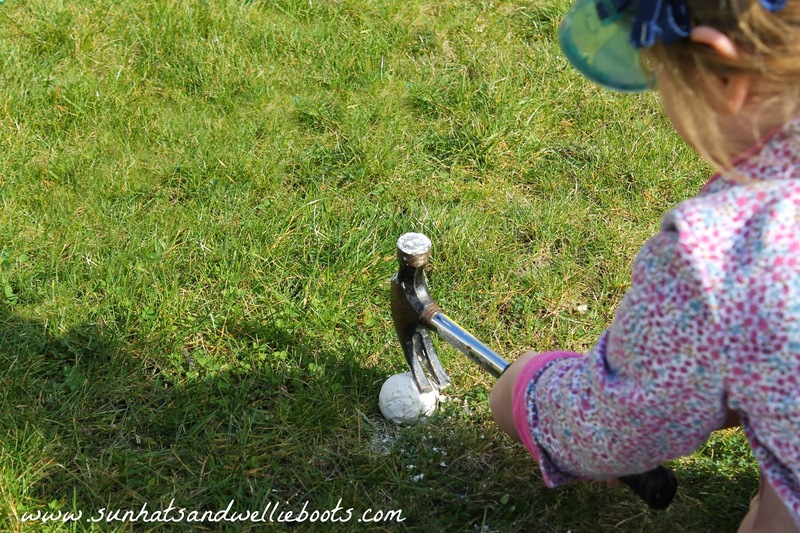 She soon discovered that the egg did not stay still, & that the greater the force from the hammer the more likely the egg was to roll! After trying to break the egg on the grass Minnie realised she needed the solid board underneath the egg again as it was slowly sinking into the soft grass. It was fascinating to observe her thought processes & how she adapted her movements. 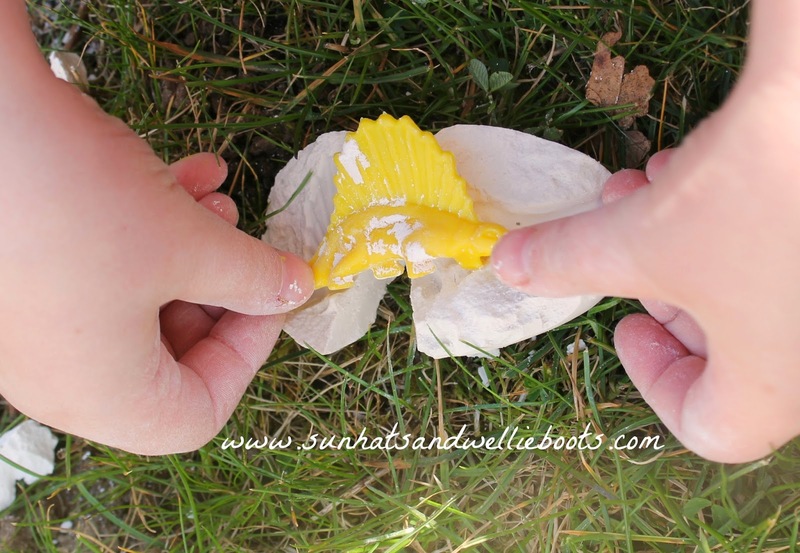 What a fun way to learn about forces, movement & materials! She tried chipping away at the egg with the knife which helped create a few dents, and enabled her to apply smaller more controlled movements. And then suddenly this happened! We discovered a dinosaur! As Minnie excavated the other eggs we started to notice something on the plaster. 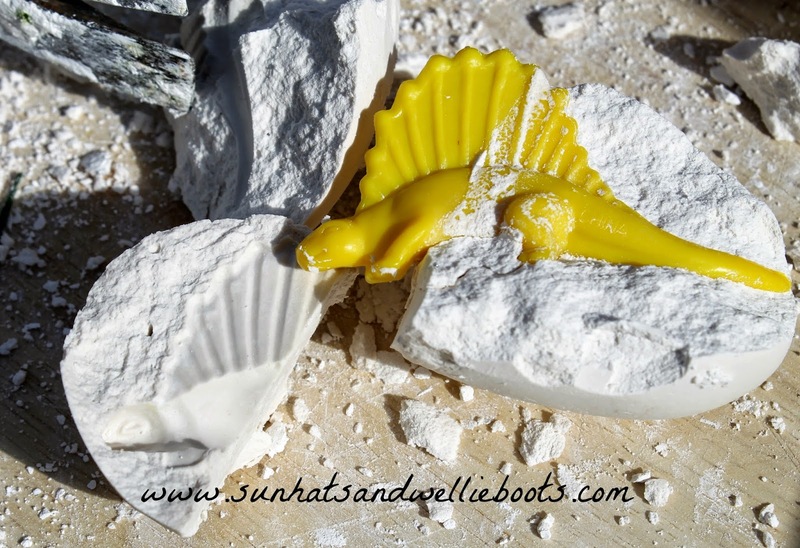 When each dinosaur was released from its egg it left an impression & pattern in the plaster. 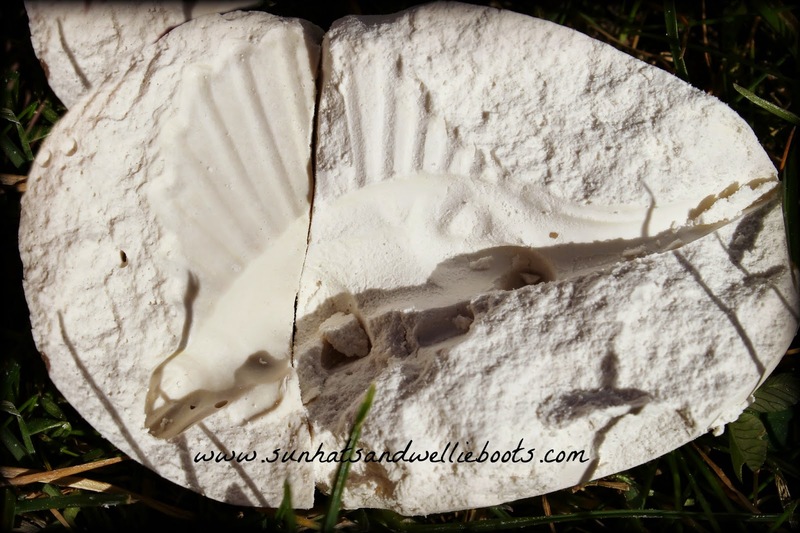 We had created our own fossils! I was amazed at how clear & visible the patterns were in the plaster. When all the eggs were opened Minnie was able to match up the fossil with the corresponding dinosaur. 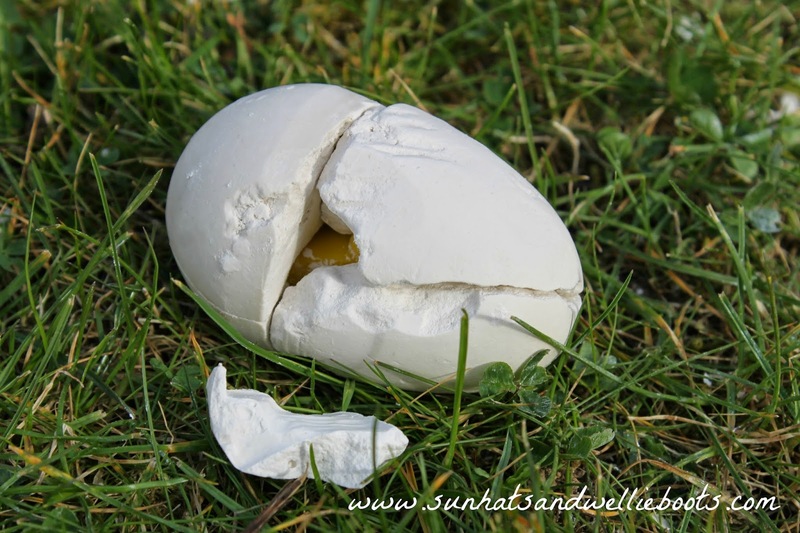 And if the egg hadn't cracked too much, she was able to piece all the fragments together to form the original egg shape with the dinosaur inside. What a great 3D puzzle to have made! This is one of those activities which offers so much learning & discovery, in fact it offered much more than I could have imagined. Minnie was able to create & discover freely as new activities flowed from the original one we started with. 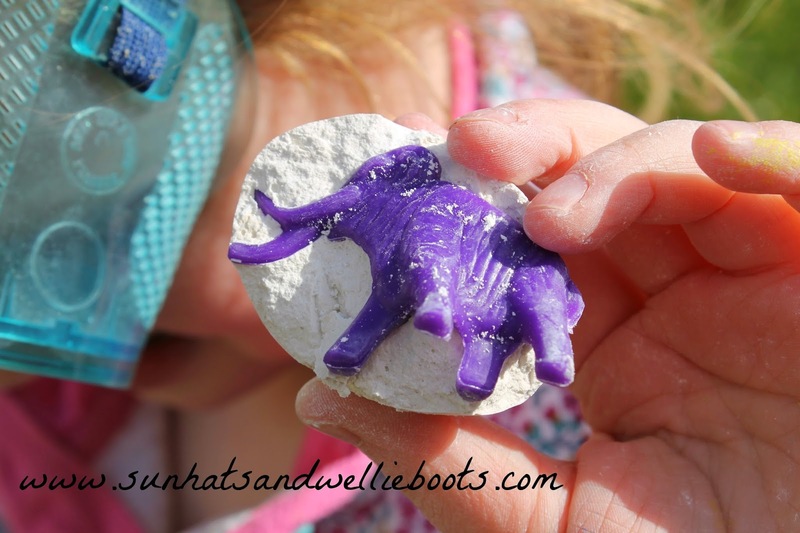 We'll definitely be making these again as they were such fun to explore from start to finish! 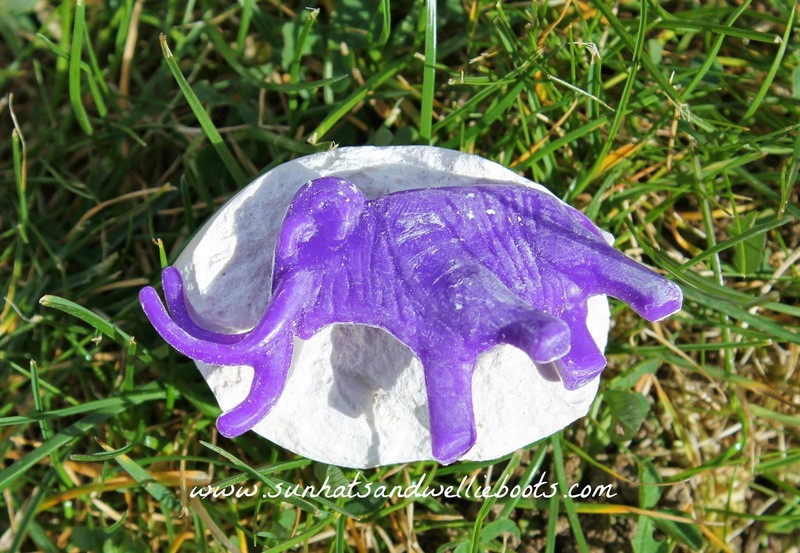 I think they'd make great alternative Easter egg gifts, & would be brilliant for any dinosaur fans.